The brand offers this year a great variety of models in its sunglasses collection. Chanel believes in sobriety with light tones and degraded lenses. Moreover, the use of different materials and the combination of them gives us original and fresh touches this summer. 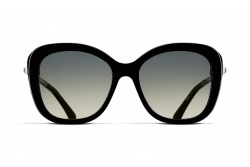 For this summer, Chanel presents a collection of sunglasses whose main element is the acetate. Summer collection presents simple designs. 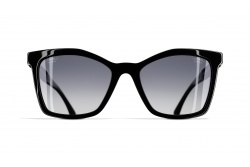 Sunglasses don’t have many ornaments, by the contrary, through simplicity the brand looks for beauty. The only thing that stands out far away from their colors and shapes, in the brand’s name on their temples. Cotton blue: This collection counts on comfortable sunglasses that follow the last trends. We can stand out models such as CH4505 and CH5406. Miss Rope: Chanel joins to the chain trendand use this element in some of its models. CH5407 or CH4250 are the perfect choice for this summer. Eye’conic Animation: Through timeless and modern models, Chanel looks for stand out with models such as CH5408 and CH5410. We can find metallic models with mirrored lenses in different colours and shapes. Models like 4224 and 4226 stand out from the rest. In fact, they combine the colour of the frames with the colour of the mirrored lenses, giving the sensation of being a unique piece. 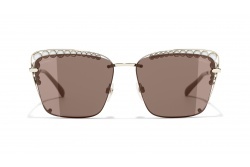 Furthermore, we can find acetate frames with classic shapes with modern and attractive combinations of colours. In this line we can emphasize models like 5322, 5349, 5350, 5372 and 5373. This summer the Italian brand also bets for combinations of acetate and metal, we can see it in models as 5352, 5353 and 5374B. These glasses maintain the classic shapes of Chanel adding in its temples metallic tones and bright details that make them modern and elegant.